Tonight, I'm thankful for many things. I would make a list but it wouldn't explain why so I'll paraphrase. I'm thankful that I'm not so caught up in other people's drama that I let it disturb my life. In the end, you are responsible for you. Getting caught up in others problems will only bring problems to you. Those who have done wrong will be judged by the one true God, not the ones on earth who think they are a god. As my mom always said, "if it doesn't involve you - stay out of it. Better to keep your nose clean than to be caught with it otherwise." I'm thankful for a faithful man. A man who doesn't stray away from the women he loves. I'm thankful for our standards, if you cheat then you're gone. If you aren't happy with the one you're with, call it quits and move on. Cheating on your man or him cheating on you can never be made right after the hurt that does happen then and over time. My parents have been married over 39 years and one thing I have learned is it's not always easy but working these out together and talking things through will get you through the tough times. Finding some other female or male will only make things worse. Again, "if it doesn't involve you - stay out of it. Better to keep your nose clean than to be caught with it otherwise." I'm thankful for a home to come to after a job that pays the house note and other bills. Without that job, I wouldn't be able to come to my home and cook and clean (even though cleaning isn't always fun). Without that job, I wouldn't own the things that I do today. I take care of the things I own and am thankful I can say they are mine. I love sharing these things with friends and family. Being able to open up my home for dinner and conversation makes me happy. And having those saying they are comfortable being here tops it off. Take pride in your possessions and do not dwell on the things that aren't yours. And to keep it short, the last thing I'm thankful for tonight is true friends. Those are the ones who call to ask how your day was before spilling all of their problems. They are there in the good times and bad, will cry when you cry and laugh til they cry when something is extremely funny. They remember the phrases that were said back in the day and bring them up again at just the right moment. They understand that some days are worse than others and on that day, they leave you alone except for the little package of chocolate left at your door. It's then, when you call to thank them that they know you are ok. Those are the friends that are there until the end. Friendships come and go but those that stand the test of time are the ones that bind us for a lifetime. I have many more but those are the ones I felt like sharing tonight. 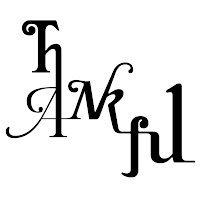 Be thankful - not just during the season of Thanksgiving but year round. Sometimes we ask why now or why not now? And then sometimes we understand. A few things are coming into play like, the weather. We have waited so long for cooler, fallish temps and fall has finally decided to show itself. Words cannot express to you the wonderful feeling that came over me when I stepped outside this morning. It was fresh, crisp and absolutely divine! Of course, waking up next to a man that will go and make all of his morning racket in another room so he doesn't disturb me sleeping is the best way to wake up. However, the morning took a quick turn for the worst when I got in my car and started to head down the driveway... the accelerator started acting up and I noticed ... a light on the dash board that I had never ever seen before. I started to freak out a bit, worried that I wouldn't make it to the dealership. But, thankfully I did make it there and had Terry talking me through it most of the way there. And the best news, it was a computer glitch in the car. Nothing major, at least that is what I was told! And to top it off, I owed them $0.00. Nothing beats that, right? Today was also the day that I realized I have one person who I can count on for anything and everything. Terry was there through every step of the way today. Cheering me on as I finished editing the magazine and uploading it to the printer. Being there to make sure I wasn't stranded at the dealership and making sure I didn't go hungry. He was there in person and in spirit all day. It's great to have a personal cheerleader. (Even though he would die if he heard me referring to him as one.) I'm grateful everyday to have him in my life and today, he made me feel like the planet was rotating because of me. I've said it before and I'll say it for the rest of my life, I love this man with everything I have. God knew the perfect time to introduce us together and I will thank him everyday for it. A few other things are unfolding before us and we will have to wait and see if it all works out but I have faith that it will happen in due time. I'm not the most patience person but somethings are worth the wait. So for now, I'm not asking why not and why not now? I'm just thankful for the now. As promised from my last post, here is a recap of what we had with the delicious roast last night. Mashed potatoes, cajun green beans, corn and a yeast roll. with ketchup for the roast. well all of them but the fork full. I have many ways to cook mashed potatoes and here is the recipe for these yummy, fluffy whites! Wash the potatoes and cut off the bad places. Leave the skin on and cut into cubes. Boil until soft with margarine. Drain water and mix in mixing bowl with salt, pepper and sour cream. Pour into baking dish and bake for 15 - 20 minutes in a 350 degree oven. ENJOY! I sear the roast with salt and pepper, then place the roast in the crock pot filled with water to almost cover the roast. Add the onion soup mix and olive oil and set to high for 4 hours. It comes out so tender and delicious. Makes wonderful leftover roast beef sandwiches the rest of the week. Is it Sunday, already? The weekend seems like it just started. Well, for me it really just did. It's been a busy weekend and I'm looking forward to our pj rainy Sunday! We were going to go to Starkville for the game last night but I had previously committed to judge a beauty pageant back in July and yesterday was the day. We didn't know how long it was going to take and didn't want to be rushed to get there. Since we couldn't be at the game, we had some friends over to cookout and grill. After I got home from my commitment, I started cleaning the house. I'm one of those people that can't have people over if the house isn't clean. However, there is one room in this house that I don't touch. That's right, it's his "man" room. The bed is weighed down with magazines, ammo, clothes and motorcycle stuff. There is no certain place to put it which would be why it's all throw on the bed. So, when people come over, I just inform them to ignore the room. I guess when the house sells, he will be forced to clean it up. After cleaning up the house and showing it, we got ready for the game. The grill was hot, the grease was ready so it was time to throw the burgers on the grill and fry up some fries. I also doctored up some Bush's Original Baked Beans. After trying to eat and screaming at the TV, we finally came away with a WIN! Can't wait for next weeks game!! Before going to bed, I realized that I am a very blessed girl. God has blessed my life with a man who loves me, amazing friends and family who love me just as much as I love them and a life full of happiness. It's a great feeling to know that my life is exactly where it needs to be at this time. I hope everyone can feel this peace and comfort in their life. Today is the first official day of Fall 2010. 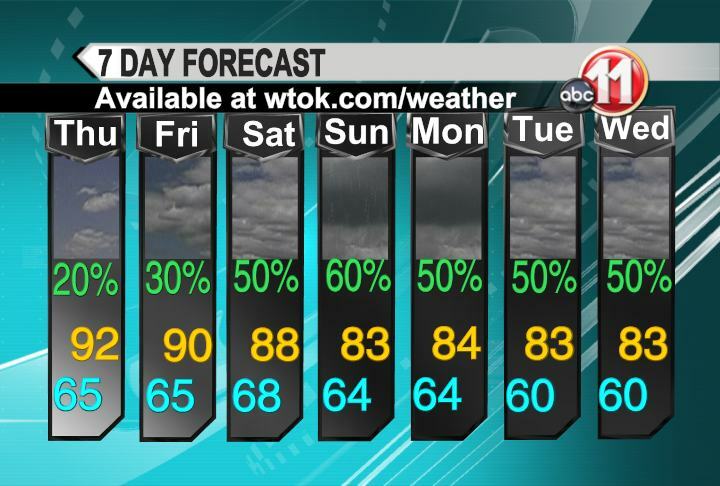 And from the looks of our 7 day forecast from WTOK... we might get some fall temps in our future! 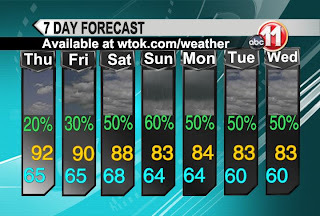 I'm looking forward to the cooler temps and the RAIN!!! Bring it on and let's hope it stays! Cupcake for dinner? OH yeah!! Inside that Gigi's cupcakes box, my bloggy friends, held two of the most massive, beautiful cupcakes I have ever seen! And yes, the title of this blog is correct. I ate, almost, all of the red velvet cupcake last night for dinner. I couldn't finish the entire cupcake but trust me I tried. So yummy, so rich and so very fattening, I'm sure. Hey, I did have a salad for lunch and nothing but part of that cupcake for dinner. I didn't touch the Cookies-n-Cream cupcake... it's in the fridge waiting for me when I get home. As for what I will be doing later tonight, walking. Walking until I can't walk anymore to hopefully burn off the most delicious cupcakes, ever! Thanks Gigi and please, please - do NOT open a store in Meridian. Let me just start off saying that I love my nieces. They rarely ever are in a bad mood and the one thing I love is that they LOVE their Auntie Joy!! Their mom Paula had to go to a doctor's appointment in Jackson this morning and I got the girls so they didn't miss school. I did this quite a few times last year but Ava wasn't in school yet and she would go with her mom to Jackson. However, this year she started to preschool, too. SO... I had a back seat full today. Two car seats, two book bags, two little voices talking non stop in the back of the car - you get the drift. I got the girls to school on time and with no crying I might add. And I went to work... no clue that time would fly by that quickly. I picked them up from preschool and we called Terry because he said he would go to lunch with us - only to find out that he couldn't go with us due to work deadlines. When I asked the girls where they wanted to eat - they said Chick-fil-a. So then I said well.... what do you want from there. Anniston said, "chickie nuggets, frenchie fries and ROLLS!" Ummm, rolls? They don't serve rolls!!! So I asked her if she really wanted rolls and she said, "YES YES YES!" I said - so where do you want to go and "Charlies" was the answer. Yep, me and two children 4 and under going to dine in at O'Charleys. 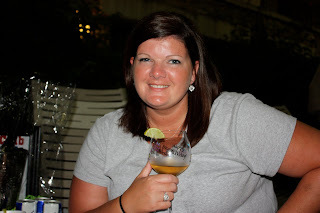 Fortunately there were no spilled drinks or meals and Anniston ate 3 rolls and Ava had 2.5. I guess they love bread like me! Friday morning I was sprung with the idea of going to Birmingham with the boys Saturday to get a gun safe and bring it home. However, I was invited and told the Cheesecake Factory was for lunch, just for me, well - then they decided it was going to be a boys trip. So, I stayed home. I was disappointed but got over it quickly because I was going to have a friend over for dinner that evening to watch the MSU/LSU game. Only I get a call about a few hours before saying that she had to cancel. Upset, yeah I was. I felt like no one wanted anything to do with me. After Terry got home, we ended up with his neighbor coming over to watch the game. MSU, lost but we watched hopeful the entire game. Sunday, we decided to have a "quiet" day. And that we did. No make up, no dressy clothes... just pjs and a ponytail. After we grilled and fed the neighborhood dog, Jug, we settled down to head to bed. 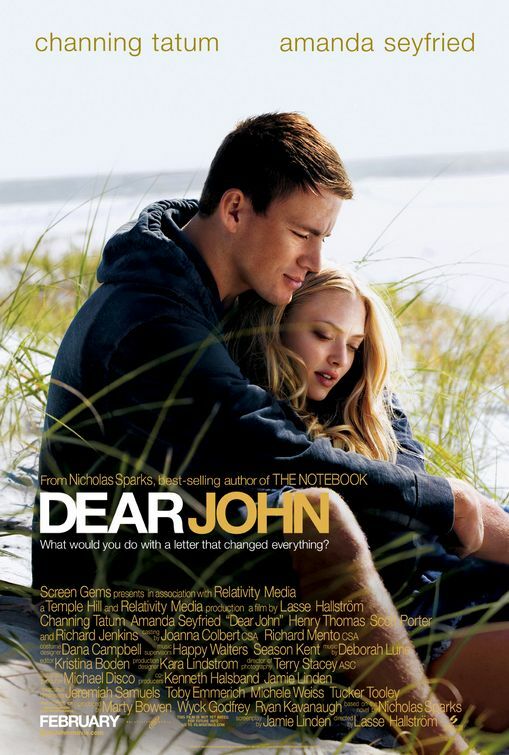 I noticed on the "guide" that Dear John was coming on at 7:30. Terry said no but finally gave it to let me watch it. After all, I watch bloody shoot em up movies all the time with him. I loved it - a great romance movie. He fell asleep within the first 45 minutes. Oh love, it's all about give and take. If you haven't seen the movie yet, I would suggest it for a girls night. Or if your man has misbehaved. You'll cry and smile but in the end... you'll be so glad you watched it. 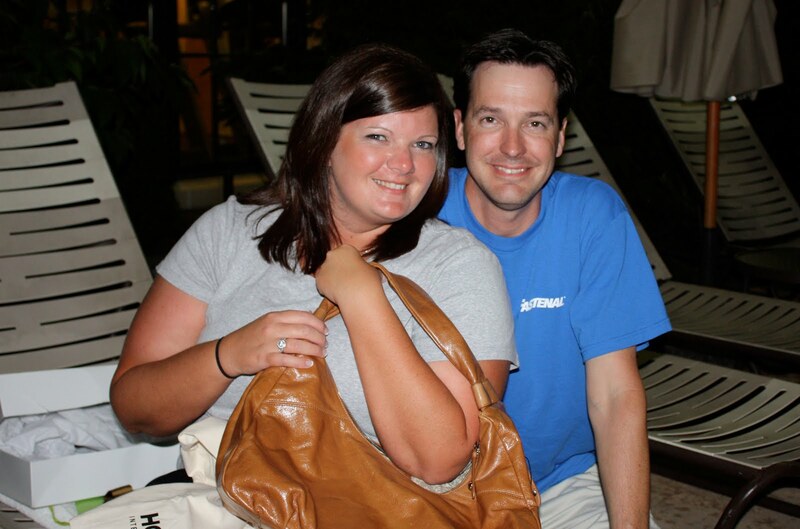 Back in June, the love of my life took me to Ross Bridge Resort in Bham for my birthday weekend. Some of our friends joined us for the weekend. 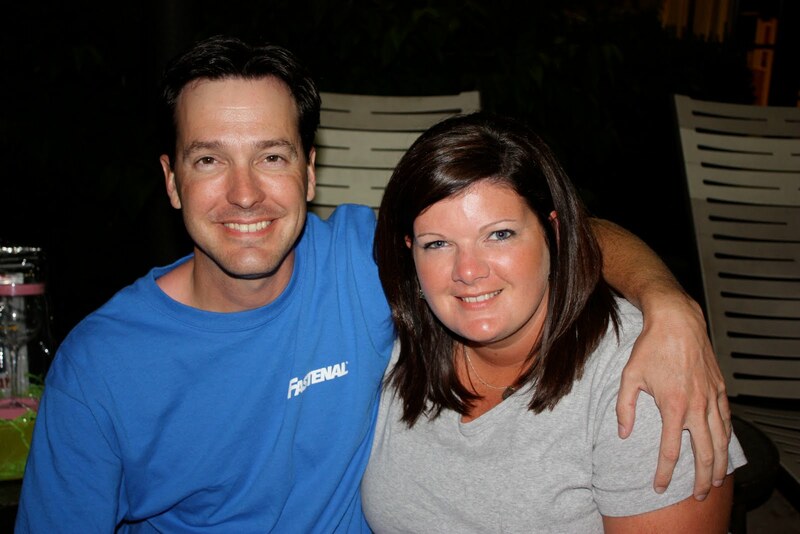 Angie and Mark drove over from Meridian and the Van Doren's came over from Pelham. We had a wonderful time together and enjoyed celebrating during dinners and on my birthday at the spa. (The guys didn't join us in the spa.) 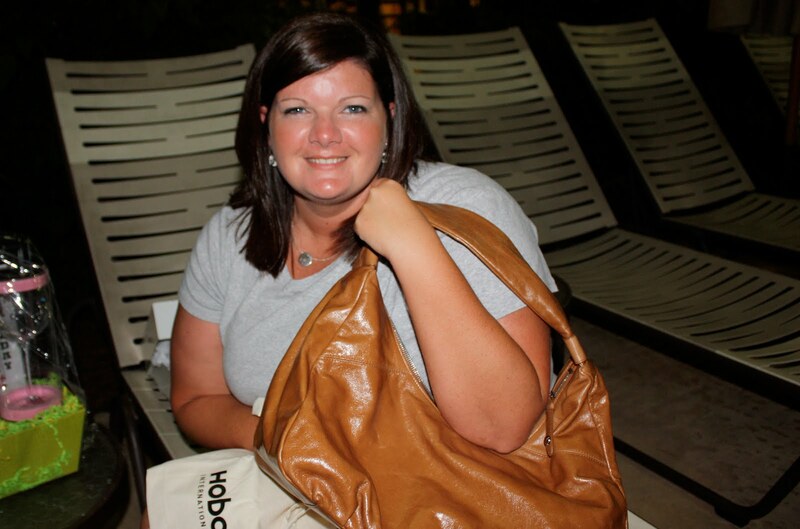 We arrived on Friday evening and relaxed by the pool with drinks and then went up to dine at one of the resort restaurants. Saturday, we sunned by the pool and enjoyed the salt water zero entry pool. 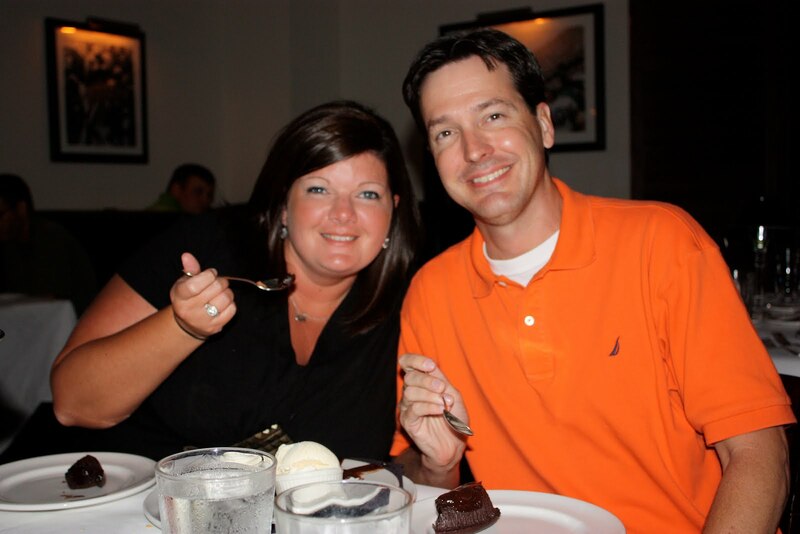 That evening, we got cleaned up and went to Shula's for dinner. The presentation of the food, the taste of the food and the service was incredible. My steak was delicious. And since it was my birthday... we got to enjoy a chocolate lava cake with ice cream and homemade cool whip. 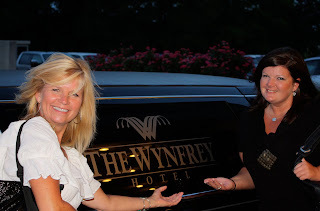 Angie and me leaving in "style"
After leaving Shula's, we went back to the resort to open PRESENTS! The first present I got was from my AMAZING love, Terry. He got me the Hobo purse I had been wanting and I had no clue until I unwrapped the present. Yeah, he's pretty awesome. After waking up the next morning from the worst nightmare I've ever had, the girls went down to the spa for a 75 minute massage. And just let me say - that was the fastest 75 minutes ever! We packed up and left the resort but before heading back home, we went to the Cheesecake Factory for lunch and dessert. And if you know me - you know what I had for dessert! That's right... red velvet cheesecake! The weekend was the perfect start to my 29th year on this earth. 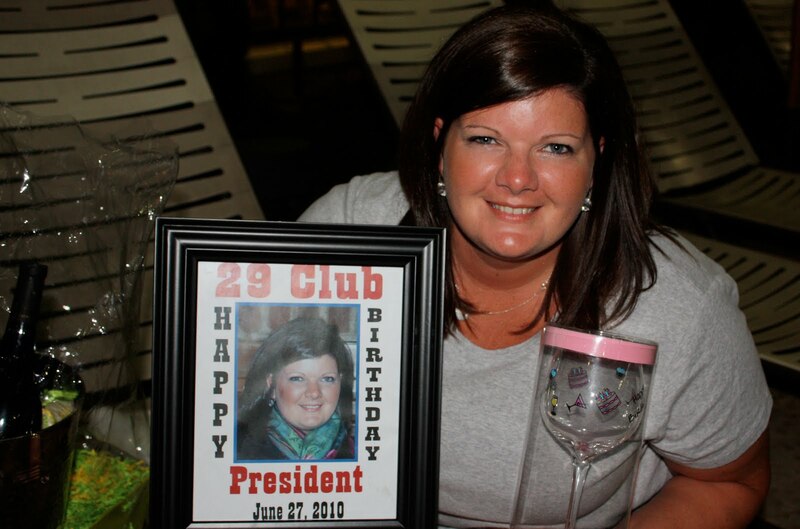 Can't wait to see what else this year holds before I turn the big 2-9 again! There is so much more I'm ready for but the main things are FALL, FOOTBALL, TV nights & being with my LOVE. Have you ever had one of those really quiet mornings where you don't say anything? No ones called so you haven't really spoken anything except... come on Marleigh, let's go outside to potty. Well, that was the morning I was having this morning. I get in the car and head to work. XM is pouring through the speakers and if I was in a good mood, you might see me singing to it, however this morning I looked like a deer caught in a headlight. That is until I come to a stop light at 14th street, where I see what we have all done - a lady screaming at someone in another car for doing something, well, stupid! She threw up her hands, screaming (not that anyone except the passengers in the car can hear her) and shaking her head. Yep, I've done it before, too. BUT now, I know what it looks like and trust me - it's entertaining to see. I got the biggest laugh from witnessing that. And it made my very quiet morning erupt into laughter. So thanks lady in the silver 4 door car for turning in front of the lady who obviously didn't approve of your move so I could see her reaction. Of course, not even 4 blocks up the road, a car is moving along in front of me and sees her destination about 2 seconds before she is to turn. Up went my hands, shaking my head and saying... what the hell were you thinking? I guess it happens to the best of us. Be safe out there and remember - you never know who's watching! I'm a sucker for pecans. I love to eat them plain or all "dressed" up. And this time of year, some of my mom's friends get together and place a huge order of pecans just in time for holiday cooking! The best part is, you can order them as whole, halves or pieces. And yes, I'm jumping up and down because I remember having to cut them into pieces during the holidays before mom started ordering them that way. Since I've been out of my parents house for almost ten years, I started learning new ways to cook things and give some of the items she use to cook, a new twist. 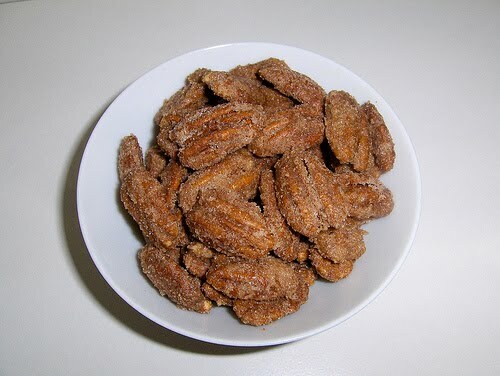 And now I'm giving you my new twist on pecans. I make these for wedding or baby showers and they are always around the house during the holidays. Enjoy - and let me know how you like them. Preheat oven to 250 degrees. Beat egg white until stiff. Slowly add brown sugar, beating on medium speed. Add vanilla. 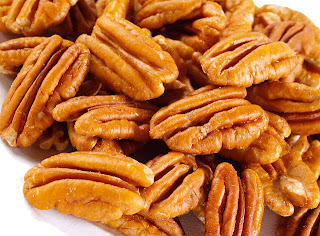 Fold in pecans and make sure they are coated well. Place pecans on a greased cookie sheet one at a time. (If they stick together, they cook together.) Cook for 30 minutes. 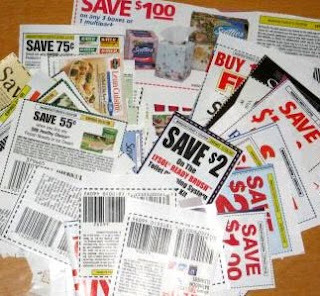 Coupons, coupons... oh how do you use these coupons! I'm all about saving some money and have recently started back trying to use coupons. Only, I'm clueless when it comes to figuring out the best deals. So, this blog post isn't long but I need the comments to be helpful! Advice, please!!! I'm proud to be a part of a family that bleeds maroon. And even more thankful to have friends that do the same! Thursday night, we met up with my aunt and uncle before the game and captured a couple of pictures... since it was Abby's first ever college football game. I think Abs had a great time, even though it was terribly HOT and HUMID! And as we all know - I'm not a fan of either! The dawgs worked hard but still fell short. But there is always the next game!! 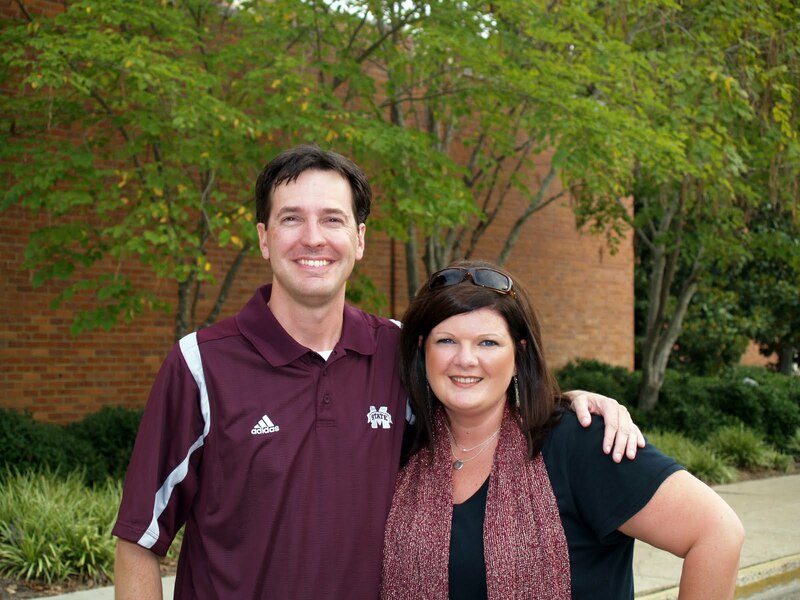 Wednesday, the day before the MSU/Auburn game, I realized I didn't have a maroon summer shirt. 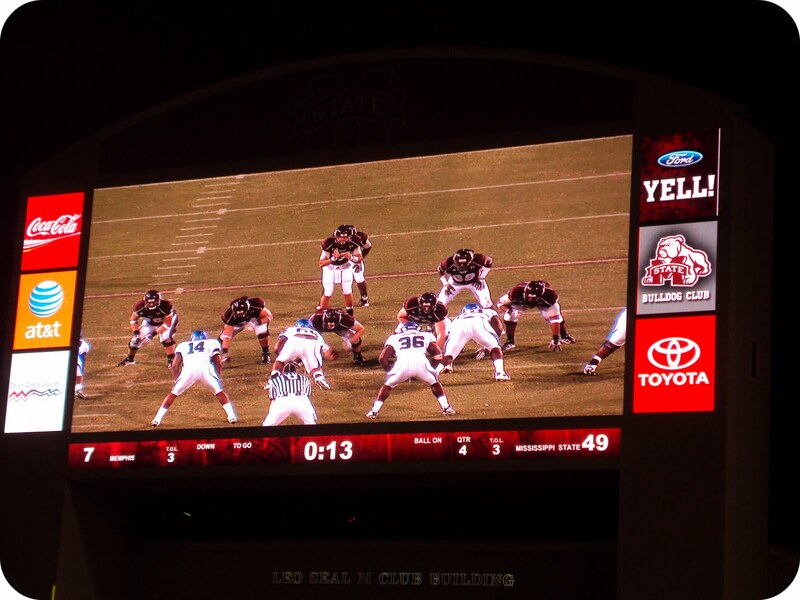 BIG problem considering that the next day was TRUE MAROON at Davis Wade Stadium. So, off to a few stores to find a maroon shirt. And with the help of Abby - found one at Cato. Bought it and didn't think another thing about it until Thursday around 2:15 p.m. Are you ready for this... it has a 3/4 length sleeve and was basically sweatshirt material. WHAT?? The game time temperate was 92 degrees!!! There was no time to run to Walmart to get a t shirt so I decided on a thin black t shirt. Only I hated the fact that I didn't have any maroon on. So, called Belle G' and asked them if they had a maroon scarf. She said no but let me go check anyway... AND guess what she found? That's right, I had maroon for the game!!! Growing up, I had a wonderful childhood. Both of my parents were home every night and at least four of the five week nights, we ate dinner as a family at the table. We were always eating by 6:30 because we never missed an episode of Wheel of Fortune. Our meals usually consisted of a meat, vegetables and some kind of bread. It was always a home cooked meal made fresh every night. To this day, I still try to have dinner ready by the time Wheel of Fortune comes on so I can carry on the tradition. My parents made sure my brother and I were cared for and didn't get everything we wanted. In high school, when my classmates were wearing Adidas, I was still wearing Keds, when they were in Nikes, I was just getting my first pair of Adidas. One thing was certain, when I got the things I wanted, I made sure they were worn, played with or taken care of... I didn't want mom and dad taking them away from me. I had chores. Yep, the chores that kids to this day still don't want to do. I cleaned my room, cleaned the bathrooms and dusted just about every piece of furniture in the house. Now that I have a house of my own, I still wish I didn't have chores, but I'm glad my mother taught me how to keep things in order or otherwise my house would be a nightmare. After the chores were finished, I could go outside and play with my neighbors. We lived in the country and I was brought home from the hospital to the same address I lived until I moved out. My parents still live there. Our neighbors had a son a few months younger than me and had a daughter a few years later. I still miss the days where we would meet outside and make paths in the woods to ride our bikes. (That was the only time I ever wanted to use a rake.) It's funny how we have grown up and gone in different directions in our lives. A few weeks ago, a death in their family brought us back together for a short visit. It was fun to reminisce about the good times we used to have and to catch up on how our lives have changed for the better. Sometimes I miss those summers of playing pretend with the neighbors. Only then we were wishing our lives away ready to get our drivers license and move out. If we only knew then what we know now. During the school year, I had afternoon activities. Dance, piano, voice and show choir kept me busy after school. Whether it was going to a lesson or staying home and practicing, my parents made sure I had the opportunities that they never had. I'm thankful they took me to my first piano lesson during my kindergarten year. I kept it up for 13 more years taking lessons and practicing every day. It's something I will have with me for a lifetime. Today just about every kid is playing soccer. But when I was in school, soccer wasn't a big sport. Just goes to show you how time can change things. It's fun to think back on being a kid, tween and teenager. And it's fun to see how things have changed since I was one many years ago. I didn't face the same issues that today's youth have to deal with. But it is good to see that today's youth are making a difference in the world. I make these cookies every Christmas and decided to make some for tonight's MSU football game. Since the recipe makes so much - I sent a bunch with one of my best friends, Lauren, for their mountain getaway and I'm sending some with my dad when he picks Marleigh up today. It's EASY, their YUMMY, and the recipe makes a TON! In a large mixing bowl beat shortening and butter with mixer. Add brown sugar, granulated sugar and baking soda. Beat in eggs and vanilla. Beat in the flour. Stir to be sure all ingredients are combined. Fold in chocolate chips and peanut butter chips. Bake in a 375 degree over for 10 - 12 minutes or until the edges are lightly browned. Seriously - it makes about 60 cookies! ENJOY!!! First batch after coming out of the oven! I recently came across a lipstick that has become my favorite!!! Urban Decay's lipstick in Sellout. I love the color, the feel of it on my lips and the way it lasts! You can purchase it at Sephora or click on Urban Decay to go directly to their website. It's a bit pricey $22 a tube but well worth it. I'm still looking for the perfect lip liner to go with it but right now I'm using Bare Minerals lip liner in Earth. There are many things I love about every month, but September seems to be one of my favorites. Could it be because there are changes in the air? Maybe! September is the start of college football. There is never a question about what we will be doing on a Saturday during September. If we aren't at the game, we are watching it on TV. And I seem to scream and shout at the game just as much as the others around me. Competitive - you better believe it's in my genes. The start of a new season, Fall. Now, while the south really doesn't have the traditional four seasons... there is a hint of Fall. The leaves start to change color and fall from the trees. The breeze can put a chill in the air and give you a slight moment of wanting a blanket. The things we smell even change. We go from beach and fresh picked flower scented candles to warm apple pie and pumpkin spice scented candles. The decor even has a different hue. It's now burnt orange, browns, deep reds (my favorite) and yellows. The flowers change from gerber daisies to mums and you might even see a scarecrow or two. Sitting outside doesn't require you to perspire. Evenings at home are now enjoyable and the really chilled nights might even get you wanting to light up the fire pit. I'm hoping we are able to do this soon. 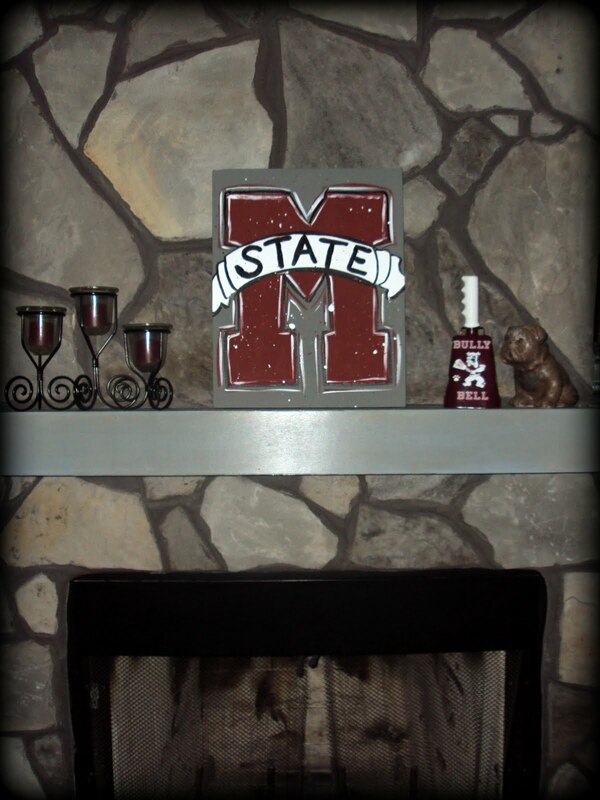 I love a fireplace, whether gas logs or the traditional wood burning fireplace. Reminds me of spending nights in front of my parent's fireplace watching TV. If you can't tell by my tone, I'm one happy girl. Not only do I have one of my favorite months here, I get to spend it with the love of my life and my best friend, Terry. No telling what else the day will hold but one thing is for sure... nothing but fun and laughs for this Laborless day. 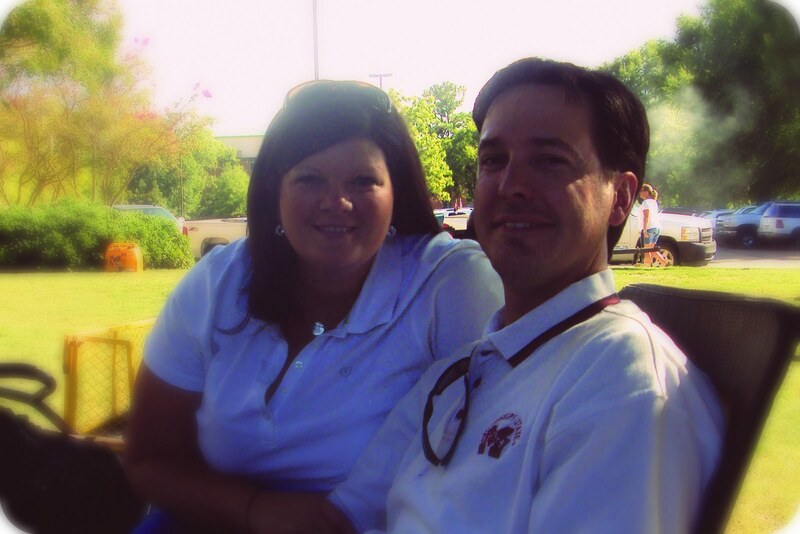 Yesterday was the first game of the season for Mississippi State football! We arrived at the campus and enjoyed a few hours of tailgating before the game started. My dad's family has been tailgating for a couple of years at the home games and we started joining them last year to enjoy the atmosphere before the game gets started. Nothing like seeing all the Bulldog fans having a great time with their fellow Bulldawg fans. 49-7!!!! That's right!! GO DAWGS!!!! 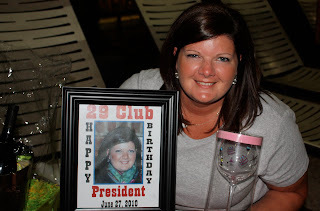 Here lately, I have been very busy with work, 393 events and family events. So when I come home after work to change and get ready to go somewhere else, this is the look I get from Marleigh. No worries though, she is at her granny and papa's house this weekend enjoying getting pampered and spoiled rotten. It's true what they say, grand kids get better treatment than their own kids. And this grand dog gets the works from her grandparents every weekend!! 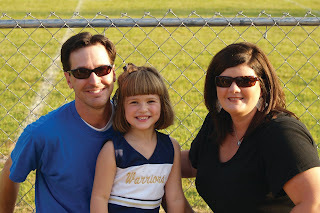 After work last night, we rushed to see Terry's niece, Emma Kate, cheer at her first RCA pee wee football game. After eight minutes, she was ready to quit. Can't blame her though, it was very hot!! The first MSU football game of the season is this Saturday. I'm so excited!!! 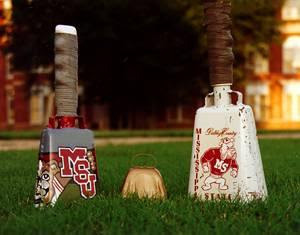 I can't wait to hear those cowbells and hear, Go State... GO STATE! I'll be wearing white because it is the "white out" game. Our family is tailgating and I was told to bring something. So I'm in need of some suggestions. I need something easy but that will travel two hours and still be great! Anyone got any ideas? I was kinda thinking pigs in a blanket but they would be cold by the time we get there. Would they still be good? HELP!